HARRISBURG, PA - Cheap natural gas could do what the worst commercial nuclear power accident in U.S. history could not: put Three Mile Island out of business. Three Mile Island’s owner, Exelon Corp., announced Tuesday that the plant that was the site of a terrifying partial meltdown in 1979 will close in 2019 unless the state of Pennsylvania comes to its financial rescue. Nuclear power plants around the U.S.
have been struggling in recent years to compete with generating stations that burn plentiful and inexpensive natural gas to produce electricity. The Chicago-based energy company’s announcement came after what it called more than five years of losses at the single-reactor plant and Three Mile Island’s recent failure to be selected as a guaranteed supplier of power to the regional electric grid. Exelon wants Pennsylvania to give nuclear power the kind of preferential treatment and premium payments that are extended to renewable forms of energy, such as wind and solar. It has not said how much it wants. Pennsylvania Gov. Tom Wolf has made no commitment to a bailout. In a statement Tuesday, Wolf said he is concerned about layoffs at Three Mile Island and open to discussions about the future of nuclear power. Exelon employs 675 people at the plant, whose license does not expire until 2034. Nuclear bailouts have won approval in Illinois and New York, but the potential for higher utility bills in Pennsylvania is generating resistance from rival energy companies, manufacturers and consumer advocates. 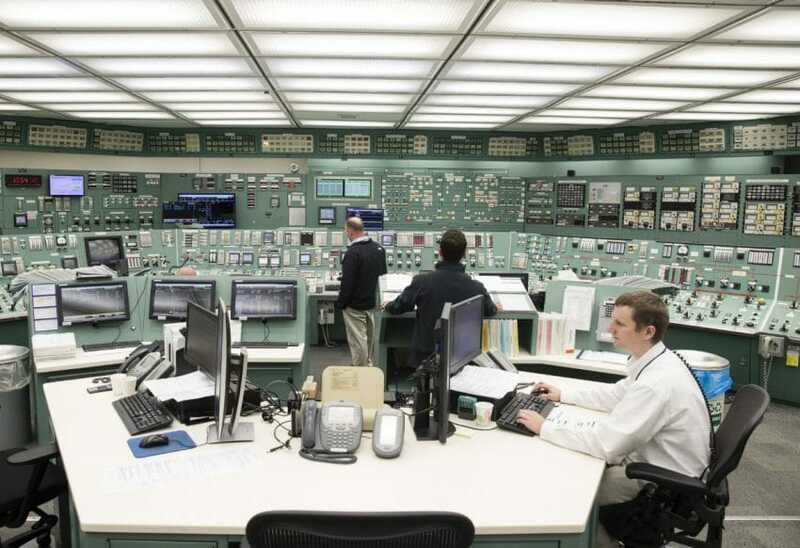 The control room seen at the Three Mile Island nuclear power plant. The site has struggled to compete in an electricity market booming with inexpensive gas. David Hughes, president of the Pittsburgh-based consumer group Citizen Power, said the notion that nuclear power is clean energy, as the industry argues, is laughable. “It’s a myth, and they’re trying any way they can to get more money out of ratepayers,” he said. In addition to contending that nuclear power can help fight climate change better than gas or coal, Exelon and other energy companies have argued that their plants are big employers and sources of tax revenue. “Like New York and Illinois before it, the commonwealth has an opportunity to take a leadership role by implementing a policy solution to preserve its nuclear energy facilities and the clean, reliable energy and good-paying jobs they provide,” Chris Crane, Exelon president and CEO, said in a statement. Around the U.S., nuclear plants have been hammered by the natural gas boom. In December, Illinois approved $235 million a year for Exelon to prop up nuclear plants in the Quad Cities and Clinton, six months after the company threatened to shut them down. FirstEnergy Corp. has said it could decide next year to sell or close its three nuclear plants — Davis-Besse and Perry in Ohio and Beaver Valley in Pennsylvania. PSEG of New Jersey, which owns all or parts of four nuclear plants, has said it won’t operate ones that are long-term money losers. Built during a golden age for nuclear power, Three Mile Island’s Unit 1 went online in 1974 and Unit 2 in 1978, coughing steam into the air above its sliver of land in the Susquehanna River, about 10 miles from Harrisburg. In March 1979, equipment failure and operator errors led to a partial core meltdown of Unit 2, leading to several days of fear and prompting 144,000 people to flee their homes amid conflicting or ill-informed information from utility and government officials. Scientists worried at one point that a hydrogen bubble forming inside the reactor would explode with catastrophic consequences. Experts have come to no firm conclusion about the health effects or the amount of radiation released, though government scientists have said the maximum individual dosage was not enough to cause health problems. Regardless, the accident badly undermined support for nuclear power. No nuclear plant that was proposed after the accident has been successfully completed and put into operation in the U.S. The damaged reactor has been mothballed, but the other reactor is still in use. Exelon says the operating costs for just the one unit are high, further straining Three Mile Island’s financial health. Pennsylvania is the nation’s No. 2 nuclear power state, after Illinois. Closing Three Mile Island would have little or no effect on electricity bills, analysts say. But the power may be replaced by electricity generated by carbon-emitting fuels such as coal or gas. Because of the flood of natural gas on the market, a lot of it from the Northeast’s Marcellus Shale formation, dozens of new gas-fired plants are coming online or planned. At the same times, states are putting more emphasis on renewable energy and efficiency.